How Much More Must Go? This photo was taken on September 6, 2018 at 4:13 AM. The location was on a major artery into Washington DC where I stop to by Starbucks Frappuccino’s on my way to my part time job. The "Take It!" came when after having watched one letter go out after another through the course of time to have the remainder get to a point where only the initiated would know what the establishment was - I decided to take this photo. It has a sort of sad funny way about it, almost as if this signage is a part of an automatic light switching set up - to have certain lights turn on at sunset and back off at dawn. Perhaps it is not on someone's periodic (once a week at least) check list to make certain all the lights are in good working order. To me, all lights in shape - are an indication of how on top of their game an organization or business is - no matter what kind of concern it may be. The After Take: The very next morning after I took this photo - I made my usual stop for coffee and got out of my car - and looked to see the missing letter sign - only to find that part of the neon signage had been shut off. I had one of those "what is going on here?" moments. I will keep a watch on this sight to see how long (if ever) it takes for them to repair the sign and get it back to work for them. An update will be posted. I think all of us have encountered a letter light out on occasion. The bigger the signage - the goofier it seems to look. What has always been amusing to me - is when a letter light goes out - and a new word is formed because of the outage. Sometimes it is the small stuff that plays over and over in our mind. Upon second thought - the good thing to have done - would have called for me to take a few extra minutes and fill out a post it note letting them know of their light out situation and stick it to the front door with a salutation of "Attention Manager.” This would have earned me some points in my book of good deeds. We had a laugh over this one. My husband saw it and started talking with little blank pauses in the middle of a word. I always wonder why they wait so longto replace them. 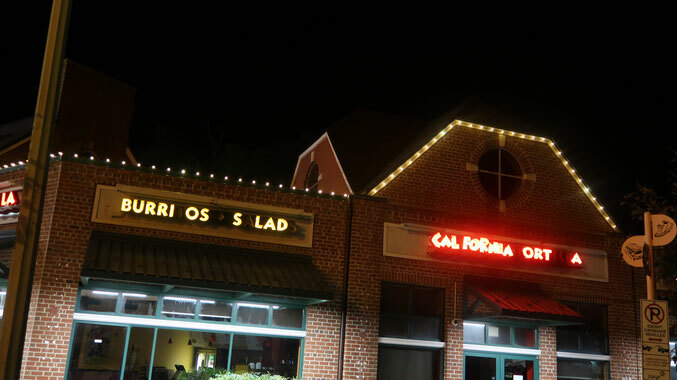 Burrios Slad and Calfornia Ort A.... two of my favorite restaurants. For a moment I thought they actually misspelled California, lol. Then I noticed all the other gaps.